“The time to repair the roof is when the sun is shining,” said John F Kennedy at the State of Union Address on 11 January, 1962. Union Finance Minister of India, Arun Jaitley, appears to be following in letter and spirit what the US president had suggested 44 years ago. He has learned that politics is more important than economics the hard way. He also knows that his party, in spite of its unbeatable numbers in the Lower House of the Parliament, just cannot push through the all important Goods and Services Bill, which is described as the biggest tax reform measure in the country, unless he can muster the support of more and more regional parties in the Upper House. For want of numbers, he has been facing a road-bloc all these months. Things were at a standstill. But now he knows the sun is shining brightly. And the roof can be repaired, with Prime Minister Narendra Modi doggedly pursuing what is being described as “politics of inclusion – and not exclusion” for a change. This apart, the ruling party has won additional Rajya Sabha seats in Jharkhand and Haryana. It has registered a spectacular victory in Assam with the help of Asom Gan Parishad and Bodoland People’s Front. It has also made huge gains in faraway Kerala, vote-share wise. And bolstered by favourable GDP and FDI figures, it continues to be in the celebratory mode. In short, Jaitley and all his friends in the NDA can sniff a “feel-good factor” all around. 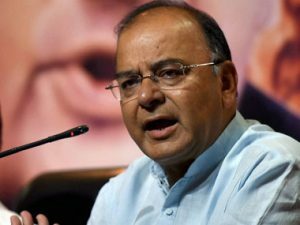 Little wonder then that the finance minister did not lose time in making more and more regional parties from the opposition ranks agree to the idea of GST in principle at the meeting of finance ministers from 22 states in Kolkata on Tuesday. And if you can believe the finance minister, “all states except Tamil Nadu have agreed on the broader contours of GST.” But regardless of Tamil Nadu’s resistance, AIADMK supremo met Prime Minister Modi in New Delhi on Tuesday in a meaningfully congenial atmosphere. They appeared to be at their smiling best. There is, at the same time, a third angle to the logjam in the parliament: The BJP’s dream of having a Congress-mukt Bharat cannot be achieved unless there is a Congress-mukt Rajya Sabha at the de facto level. And to be fair to the BJP, it must be said that the saffron outfit has been much more flexible in reaching “understandings, adjustments and alliances” with even antithetical parties compared to the Congress. Yes, it is historical truth. How many of us remember that the Jan Sangh, which had merged its identity into the Janata Party, had in fact joined hands with Socialists and Marxists in 1977? And how many of us recall that the saffron outfit had rushed to join forces with even Mulayam Singh Yadav in the 1989 elections? Indeed, the BJP had shed its tag of “untouchables” long ago. And if you have an eye for details, you would find that the current size of the BJP-led NDA is humongous: There are as many as 45 members from different states in this alliance. And 14 of these member-parties are represented in the Lok Sabha where the NDA accounts for 336 seats in all. In comparison, the Congress-led UPA occupies no more than 49 seats in the Lower House. However, the scene is quite different in the Rajya Sabha where the UPA accounts 70 members as against NDA’s 67. It is the “others” who hold an ace up their sleeve with 108 seats. Herein lies the catch. The fate of the GST largely depends on leanings of this “camp of others”. You can now understand why Arun Jaitley is burning midnight oil to ensure a positive response from the regional parties. He is doing his best. But the gap between the proverbial cup and the lips remains. And, on its part, the Congress is not sitting idle either. Sonia Gandhi and her aides are trying to build bridges with Mamata Didi and some others afresh. Let’s keep our fingers crossed till the House of Elders meets next time.